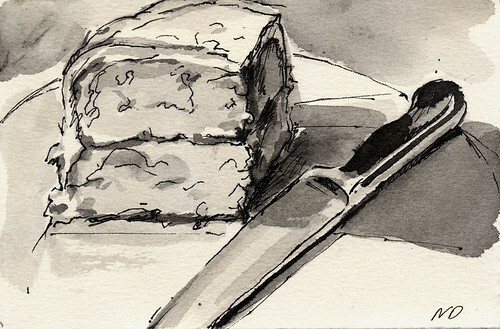 Here's the latest free postcard art-- our leftover coconut cake is lucky number thirteen. Enter by commenting on this post and emailing a delivery address, just like it says here. Is it unethical to try to snag more than one postcard? Because if not, I'm in. Coconut cake is one of my favorite things in the whole entire world. Stop, you're making me hungry and I haven't even eaten breakfast yet! I like the simplicity of it, yet it still is very realistic in a New Yorker cartoon sort of way. Cake to go with tea. Oh count me in on this one! Your puppy licking the cake would have made it better. But if you have one left I would love to have it. Bebe Bahnsen 934 Cooper Avenue Columbus, GA 31906. Thanks. Wow, a full slate of competitors for today's postcard. This is a first I think. Well, let's get to the roll of the dice. The Yahtzee cup is at hand...I'm shaking it...a good shake...and it's a four. Dawn-Enigma Artist is the big winner! Big round of applause to everyone for participating-- we do appreciate your visits. More coming. OH My Gosh!! and I'm the one who usually wins nothing. I'm buying a lottery ticket today! I will be checking my PO Box a lot sooner than last time!